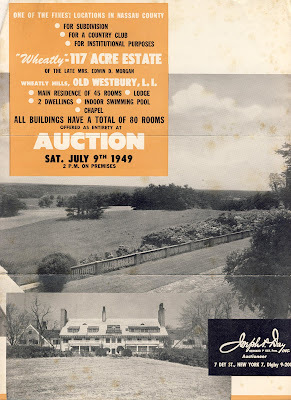 A brochure advertising the auction of 'Wheatly', the Edwin D. Morgan III estate designed by McKim, Mead & White c. 1890 in Old Westbury (what was then Wheatly). 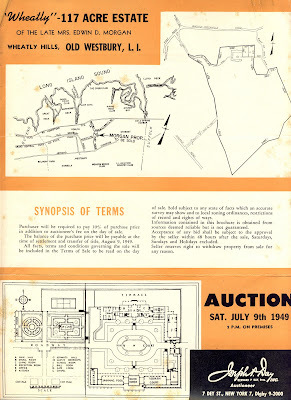 This auction brochure follows THIS brochure when the house was for sale. 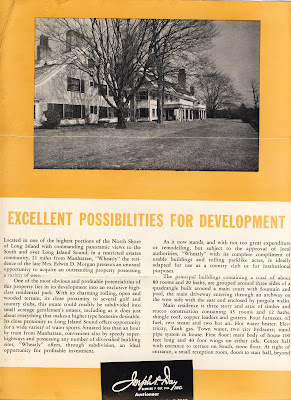 No buyer had been found and the property was auctioned leading to the demolition of the center portion of the house (seen directly above) and the subdivision of the estate grounds in the early 1950s. Click HERE for more on 'Wheatly'. i read back through all the comments and did mary burns ever get that book to you? this is a great estate enclosed as it was like a little medieval town. it would be nice to see what the interiors looked like now. both houses left are not exactly shacks. of the other stuff - water tower etc. - what still remains? any gardens? There are a handful of cottages, a couple of garden walls, some paths and probably more that is covered with plant growth. The chapel is just grand! And I mean that in terms of size, by the way. 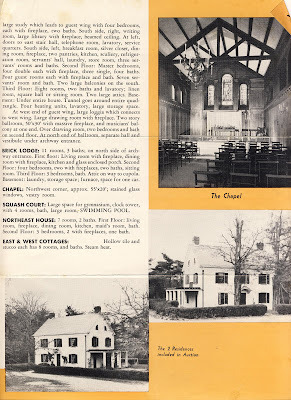 ^...There is a tab under 'Estates' entitled 'Wheatly' (found here: http://www.oldlongisland.com/search/label/Wheatly). All of the buildings are photographed and posted. The Morgans must have been terrific clients, because both houses are grand concept, and push the envelope in interesting ways. There are some evocative pictures of Wheatley in "A Monograph of the Work of McKim, Mead, & White", available in several editions.